ComicRack app for Android is designed by cYo Soft. It brings numerous phenomenal features on the board to synchronize the Android gadget to the PC in order to deliver a compelling experience for the e-comic reading. It’s a paid application designed for both Smartphone and tablets. ComicRack app has fetched an impressive rating of 4.2 out of 5 on the Play Store and appears as a boon for comic lovers. 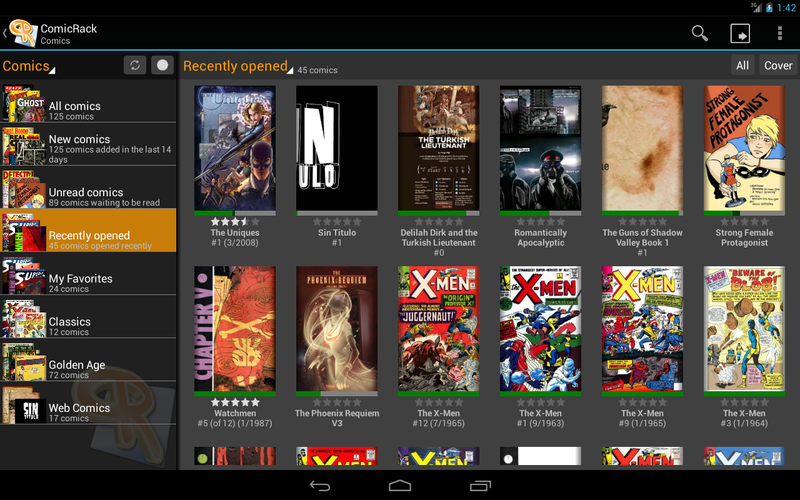 The interface of ComicRack app for Android is simple, clean and easy to navigate. It is actually divided into two main sections, named as, Library and Reader. The library in-houses all the collections of a user which is further divided into two parts, namely, list bar and Comics Browser. The list bar is a vertically aligned, easily navigated column where a user selects a comic to read from a number of default smart lists such as new comics or recently opened comic. On the other hand, Smart lists automatically sort books into categories based on the string input as the name of the author, title of the comic, series name and many more. The app costs ‎$7.89 and can be downloaded from Google Play Store. Being a paid app, it neither bothers a user by marketing ads nor falls apart in providing a pleasant reading experience. The impeccable features of the app include advanced zoom modes, auto scrolling, color adjustments, reader with single/double view, USB and Wi-Fi synchronization for Windows and many more. The notable feature of ComicRack Android app is its fluidic, blazing fast and reliable gesture support which lets a user to quickly scan and access specific pages in a while. Besides this, it provides an orientation lock function or open a window to assign a star rating or write a mini-review in order to make e-reading more pleasant and alike to the traditional reading. It unfolds a progress bar at the bottom of the page to show the status of the reading process. The app has an inbuilt twitter integration to share the reading experience with the peers. The aesthetic feature of the app is its own live wallpaper crafted from the library of the user’s which looks sensational and tapping on the same opens the file. ComicRack app requires Android version 2.2 or higher. The app is expensive, but supports nearly all the file formats such as CBZ, CBR, CB7, CBT, DJVU, ePub, and PDF files. If you are an avid comic reader looking for a flawless application, then ComicRack will never let you down.